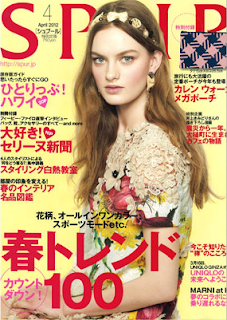 I've never been a fan of fashion magazines but I like to buy an issue from time to time, especially when I travel. When the plane takes off I flip the pages over, taken into a journey. Since I moved to Japan I noticed something different in the women's magazines: presents! Almost every women's magazine contains a little something in every issue: pouch, perfume tester, shopping bag, notebook, pen etc. The present's picture is featured on the front page. Isn't it a great strategy? This little box inside is hiding something! Well, the quality of these presents leaves a lot to be desired. But I had so much fun! 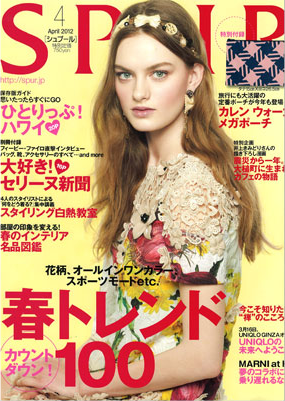 And, of course, I can read ELLE for my Japanese lessons and enrich my "girlie" Japanese vocabulary. Do you read women's magazines? What do you like about them?